Wherever possible, we always opt for letting our horses go barefoot and the Swiss Boots have helped enable us to do this during two long-distance rides of over 1500 kilometres each. Swiss Boots are simple to fit and optional, meaning that you can leave them off when going over softer terrain, but have them ready for roads or rough ground where the all-round protection they provide is extremely important. In addition the traction they offer is, in our experience at least, better than even the most expensive tungsten studs. Our horses are French Trotters, not hardy ponies, but we have only used shoes for Gwen on two occasions (one on each ride), and even this has to be put into context, because the shape of her hooves would normally render her unrideable. To date, our rides have been in Europe, where you would expect farriers to be easily available and skilled, though our own experience has been both patchy and expensive. We are planning future rides that will take us outside Europe and, irrespective of the horses we use for these, the Swiss Boots will be part of our kit. Babette Gallard, author of Riding the Milky Way. A Way to Shoe: Long Lasting Shoes That Stay Tight! I developed this method of shoeing out of necessity and through careful observation when I was traveling by horseback across the United States. It is very similar to the conventional method, however there are a couple of little ‘tricks’ that will make shoes last longer and stay tight longer over any type of terrain, especially pavement. I have never liked using horseshoes. In fact, when I first started my horseback journey, my horse was barefoot! I had no idea how quickly a horse’s hooves could wear down when traveling on pavement (roughly 75% of the time). In less than 3 weeks, I was looking for a farrier to shoe my horse. Eventually I bought my own tools and packed them with me. Horseshoes are, at best, a necessary evil. The most preferable shoe I have found for long distance horseback travel is a lightweight, flat iron shoe with no heel or toe calks. A shoe like this will wear paper thin and crack at the toe in only two weeks of pavement travel. Borium is a must. This same shoe, properly coated with borium, will last one year of pavement travel! Welding borium onto a shoe is an art as well as a science and must be done properly to be effective. Anyone who knows how to weld can do the job. Borium consists of tungsten carbide chunks in a brass matrix. The shoe is preheated first. This can be done with a hot torch flame, a forge, or even a good campfire! When the shoe is hot, borium is applied using a torch with a low flame. If the flame is too high, the borium will burn and pop! This stuff melts at a low temperature. The borium should be applied in a thin single layer (not more than 1/8” thick) for the main purpose of protecting the shoe from wear. There is no need to build the layer of borium up thick. Borium is also very effective for riding on ice and other slick surfaces such as parking lots coated with blacktop sealer! Because borium affords the shoe some traction, it is advisable that a horse not used to borium shoes be ridden on soft surfaces before riding on hard, unforgiving surfaces so as not to cause leg injuries. Horseback travelers should avoid loose shoes at all costs. A loose shoe is dangerous. It is easily snagged off the hoof and very often takes part of the hoof with it. Unfortunately, loose shoes are all too common, especially for horses traveling on a daily basis, on pavement, and especially if the horse is a draft horse! The heavy weight of the draft shoe and the tremendous repetitive impact will work the shoe loose in no time. I knew of a draft horse who suffered loose shoes repeatedly and consequently lost so much hoof material that her hooves could no longer hold a shoe! The trick to avoiding loose shoes is finishing the nails properly. Most farriers will drive a nail into the hoof wall and then ‘wring off’ the nail by using the hammer claws to twist off the sharp end of the nail close to the hoof wall. Don’t do this. Instead, bend the nail over against the hoof wall and cut it off with nail cutters. Leave 1/8” of the nail projecting from the hoof wall. When all the nails are done in this fashion, they are then seated using a ‘clinching block’ or any other piece of flat metal. Carefully file away any burrs under the nail stubs, do not create a groove in the hoof wall or file away any of the nail, as this will cause weakening. The nail stubs are then softly hammered flat against the hoof wall, and the job is done (see diagrams below). Turning the clinches in this fashion (as opposed to cutting the nail stubs short and then using alligator clinchers) will not cause tearing in the hoof wall, and they will last much longer. There is no need to smooth the clinches with a file because this will occur naturally in a couple days. A shoe nailed in this manner will stay tight for a very long time. I had shoes stay tight on my horse for 6 months straight while traveling! 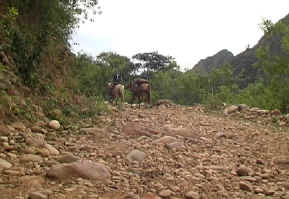 It is highly advisable to use rubber rim pads when traveling by horseback whether the travel is on pavement or in the backcountry. Rim pads do not cover the sole of the hoof and are placed between the hoof and the shoe. They absorb concussion and eliminate hoof and bone problems. For more information about how to shoe horses, refer to the book, “The Principles of Horseshoeing II” by Doug Butler. We are very proud to have Mustad (Switzerland) and Mattheis Borg (Brazil) as sponsors for our entire trip. They supply us with all the necessarily horseshoes and nails, of whatever type we want, and they ship it to where we need a new supply. Not only are we convinced that they produce some of the best shoes and nails there are, but their service is excellent. That we don't have to spend money on horseshoes is of course very important for us, but as important is that we know that we always have the best for our horses. For most of the part where we have been traveling through, there are no horseshoes to find, and if you should be lucky enough to find any, they are usually of poor quality. Most of our shoeing tools are also from Mustad, and so far nothing has broken, and the tools are admired everywhere where we shoe our horses. Our equipment also include a "stall-jack", which is basically a portable anvil. It weights almost 10 kg, but we wouldn't know what to do without it. Get the blacksmith to use tempered steel, or use Kerckhaert shoes manufactured in the Netherlands, which are a much better grade of steel than most imported shoes. I tried using 'Thoroflex' nylon shoes as seeming more hoof-friendly - all I can say is they did not work for me and my horses on rough going - don't be tempted! I use classical steel shoes, with four or five deeply embedded tungsten plugs on each shoe (each of which lasts for between five and ten sets of shoes). I use Mustad nails. For five years I tried aluminium shoes, but without any success. I carry all my own farrier equipment, made by the American Diamond company. My travelling anvil is a bit of old railway track.